Posidonia is the foundation of marine ecosystems. It is a priority habitat and fundamental to the ecological balance of the seas. Recent research has established a new scientific method for its detection, classification and volume estimation. Simrad Spain, makers the electronic instruments for professional fish finding and fishery research proposes the use of hydroacoustic technology for this purpose. - Thanks to its leaf development, the environment frees up to 20 litres of oxygen per day and per m2 of meadow. - It produces and exports biomass both to surrounding ecosystems and to greater depths. - It provides shelter and breeding grounds for many fish, cephalopods, bivalves, gastropods, echinoderms and tunicates. - It consolidates the seafloor to help offset costs and excessive sediment transport due to coastal currents. - It acts as a barrier, attenuating the force of currents and waves and thus preventing coastal erosion. - It dampens the waves through the layer of dead leaves deposited on the beaches, which protects against erosion, especially during winter storms. The disappearance of grasslands has negative effects not only on the micro-ecosystem itself but also on linked ecosystems; just think that the loss of a single metre of grassland can lead to the disappearance of several meters of beach due to erosion. Furthermore, regression of grasslands involves a loss of biodiversity and deterioration of water quality. Among the underwater flora of our environment, the Posidonia Oceanica is of special importance. It is a species that has a powerful attraction to be endemic to the Mediterranean and the key to ensuring biodiversity of the seabed. It is subject to many threats, given the increase in human activities such as chemical spills, discharge of brine from desalination plants, construction of port infrastructure and indiscriminate trawling. We must consider the slow processes of growth and recovery of a damaged area. It is estimated that the Posidonia extends through the meadows at one centimetre per year, so if you try to retrieve a square foot, it would take a century to achieve your goal. Until recently, scientists have used methodologies based on diving and capturing video images in their study areas. Current technology has improved the qualitative and quantitative research capabilities, and the application of different hydro acoustic detection systems provides a variety of information. Documents published by the European Acoustics Association, highlighted the excellent results obtained in detecting and classifying seabed vegetation by combined application of acoustic methods. They combined a single beam echosounder, which enables classification of the seafloor and its vegetation, a multi-beam sonar, which generates micro-relief, and a side scan sonar, imaging the seafloor reflectivity and thus enabling the spatial classification of seafloor types and vegetation. The data from these systems are merged and processed, resulting in 3D images of the same quality and precision as found in the field of biomedicine. Quantitatively speaking, this technology can work simultaneously with oceanographic parameters. As for the quantitative method, prospecting new technologies allow a wide area of study while minimizing data collection time. Thanks to the digital storage of all data acquired during the survey, one can make historical databases that allow monitoring of the expansion or reduction in the length of the field of underwater flora. You can also study how quality varies over time by comparing contemporary data with the previous sampling. In an experiment conducted in France collaboration with TS SEMANTIC GESMA, for defence purposes, the aim was to detect mines hidden in the vegetation. Several systems were combined to cross-correlate the signals from different types of bottoms (sand with and without plants, rocks) with samples obtained at different depths and with different settings of the systems (transmit power and pulse length between them). 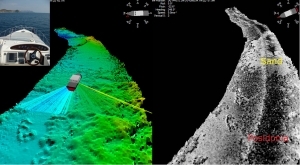 Acoustic systems combined in this test were: a side scan sonar; the GeoAcoustics shallow water wide swath bathymetry system GeoSwath Plus, which simultaneously acquires bathymetry with a swath width of 12 times the water depth and geo-referenced side scan data; the scientific high-precision echosounder Simrad EK60. The side scan sonar shows the reflectivity of the seafloor and discriminates areas where there are plants or sand. The GeoSwath Plus system provides bathymetry and geo-referenced side scan data. Both datasets can be merged to generate a three dimensional image representing the bathymetry and backscatter of the seafloor. 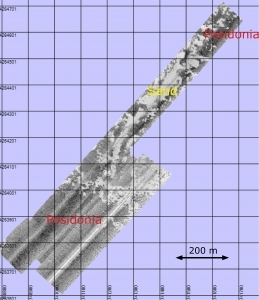 This feature allows us to correlate the three-dimensional data with the location and extent of Posidonia meadow areas. The scientific probe records the acoustic pulses to generate a profile of the seafloor. These data are recorded simultaneously with the D-GPS position. Since the sandy areas and vegetation meadows provide different signatures, by applying the algorithm analysis, it discriminates between different types of seafloor. In this first phase, it detects the presence of Posidonia. In that case the system estimates its height and abundance. The presence of Posidonia is limited to the depth to which sunlight reaches, the photic zone, so most of these studies are conducted in shallow water. This combined with the high resolution of the acoustic systems, generates maps that resemble virtual reality. This methodological concept corroborates that the innovations technology offers give high performance and ensure scientists new and improved ways to study. Moreover, these technologies enable the direct study of large areas with very high resolution, whereas the traditional approach of visual sampling was limited to very small zone and therefore the use of statistical extrapolation. The GeoSwath Plus sonar allows wide swath multibeam bathymetry and side scan data to be collected from small vessels of opportunity in water depths up to 200m beneath the transducers. The system was designed to meet the need for a wide swath system capable of high productivity surveys in very shallow waters, and can achieve swath widths over 12 times water depth. The GeoSwath provides high accuracy, high resolution bathymetry (depth measurement accuracy exceeding the latest IHO specifications), and co-registered side-scan data. GeoSwath versions are available for mounting on vessels of opportunity, jet skies, ROVs and AUVs.